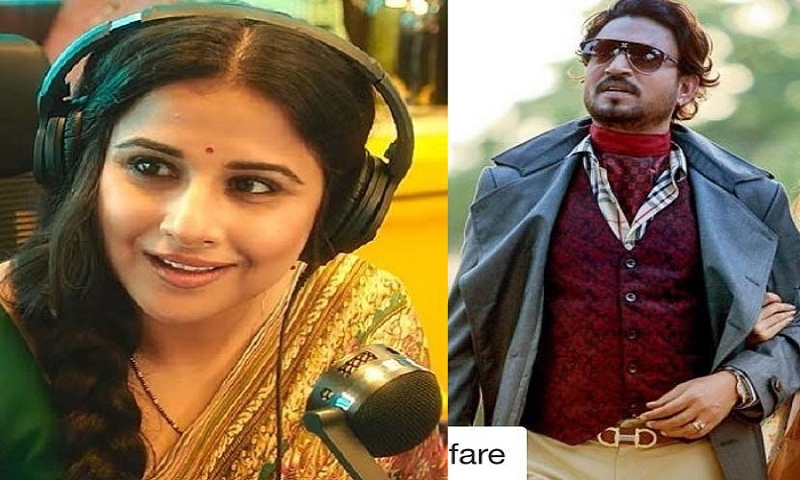 Actor Irrfan Khan won the Filmfare Best Actor in Leading Role (Male) award for 'Hindi Medium' while Vidya Balan bagged the Filmfare Best Actor in Leading Role (Female) Award for 'Tumhari Sulu' at the 63rd Jio Filmfare Awards, reports Ians. From giving the awards to iconic actors like Irrfan Khan to Rajkummar Rao, Vidya Balan to Zaira Wasim -- the 63rd Jio Filmfare Awards 2018 celebrated the talents of different ages, on Saturday night. Vidya received her award from legendary actress Rekha. Rajkummar Rao bagged two awards. He won the Best Actor in a Supporting Role (Male) for 'Bareilly Ki Barfi', and also Critics' Award for Best Actor (Male) for 'Trapped'. The evening was graced by who's who of Bollywood including Akshay Kumar, who walked the red carpet along with his 'PadMan' co-star Sonam Kapoor, R. Madhavan, Arjun Kapoor, Alia Bhatt, Shahid Kapoor, Parineeti Chopra, Saqib Saleem, Armaan Malik, Amaal Malik, Karan Johar, Preity Zinta, Rekha, Jaya Bachchan, Madhuri Dixit, Vidya Balan among many others. Meher Vij won the Best Actor in a Supporting Role (Female) for 'Secret Superstar'. Actress Zaira Wasim won the Critics' Award for Best Actor (Female) for the same film. Ayushmann Khurrana made the evening entertaining with some of the evergreen super hit cult classics like "Jab koi baat bigad jaaye", "Tera mujhse hai pehle ka nata koi", "Ruk jaana nahi tu kahi haar ke", "Kehdu tumhe ya chup rahu" and "Janu meri jaan main tere qurbaan" on stage. Ranveer Singh appeared at the function with an interesting outfit that clubbed poster motifs of various classic Hindi films. When host Shah Rukh Khan asked Ranveer about his costume, he replied: "People eat movies, drink movies, I even wear movies." Konkona Sen Sharma won the Best Debut Director Award for 'A Death In The Gunj'. Receiving the award from Jaya Bachchan and Sonali Bendre, Konkona said, "Thank you so much... It's unbelievable. I would like to thank Jio Filmfare. I would like to extend my biggest thank you to my team." Ashwiny Iyer Tiwari won the Best Director Award for 'Bareilly Ki Barfi'. Amit V. Masurkar bagged the Best Original Story Award for his Oscar-nominated film 'Newton'. the film 'Newton' also won the Filmfare Critics Award for Best Film. 'Hindi Medium' won the Best Film (popular) Award. Like last year, Jio Filmfare award ceremony has created special space for celebrating short films. this year, Jackie Shroff won the Best Actor in Short Film Award for 'Khujli'. Neeraj Ghaywan won the Best Short Film Award for 'Juice'. Filmfare Best Playback Singer (Male) Award went to Arijit Singh for "Roke Na Ruke Naina" from 'Badrinath Ki Dulhania'. Meghna Mishra won the Best Playback Singer (Female) Award for "Nachdi Phira" from 'Secret Superstar'. Iconic music composer and singer Bappi Lahiri won the Jio Filmfare Lifetime Achievement Award. Actress Vidya Balan, who handed over the award to the legend, mentioned: "It's a very special moment for me. Bappi has given the most successful song of my career." After receiving the award, the music composer said: "Thank you Jio Filmfare. I am very happy. I would like to dedicate it to my parents, wife and my full family. It's a hard work of 46 years."